A Boeing 737-800 aircraft, operated by flydubai as Flight FZ981 from Dubai, impacted airport terrain during a second approach attempt in bad weather to Rostov-On-Don Airport in Southern Russia. The airplane was destroyed and the 55 passengers and 7 crew fatally injured. Flight 981 departed Dubai at 18:37 hours UTC on March 18. A preliminary flight data analysis revealed that the crew was performing a manual approach to runway 22 with the autopilot disconnected . Weather conditions were poor with a cloud base at 630 meters, wind 230 degrees at 13 meters per second, maximum 18 meters per second, light rain shower, mist, severe turbulence and moderate windshear. 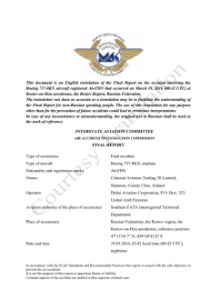 At 22:42 UTC (01:42 local time) in the course of the initial approach at a height of 340 meters (1115 feet), the flight received a windshear alert. The flight crew decided to go around and then continued to a holding pattern waiting for improved weather conditions. The flight left the holding pattern at 00:28 UTC (03:28 LT) and descended towards Rostov for another attempted approach to runway 22. As the crew were proceeding with another manual approach, they decided to go around again at a height of 220 meters (721 feet), 4,5 km before the runway. They initiated a climb with a vertical speed of up to 20 m/s and setting the engines to maximum takeoff/go-around (TOGA) thrust. One of the probable causes of the go-around decision could have been the 20-knot increase of indicated speed to as much as 176 knots within 3 seconds, which might have been an indication of a windshear. In the course of the go-around the crew set flaps to 15° and retracted the landing gear. At the height of 1900 ft (approx. 600 m) after reaching the pitch angle of 18° the pilot flying pushed on the control column, which led to a decrease in vertical acceleration of up to 0.5, increase in forward speed and, consequently, automatic retraction of flaps from 15° to 10° at a speed of over 200 knots. The short-term decrease in engine thrust within 3 seconds resulted in decreasing speed and flaps extension to 15°, although the following crew inputs to regain maximum takeoff/go-around thrust led to speed increase and reiterated automatic flaps retraction to 10°. The flaps remained in the latter configuration until the impact. The pilot flying, by pulling up the control column, continued climbing with a vertical speed of as much as 16 m/s. At a height of 900 m there was a simultaneous control column nose down input and stabilizer nose down deflection from -2,5 deg (6,5 units) to +2,5 deg (1,5 units). The FDR recorded a nose down stabilizer input from the stabilizer trim switch of the control wheel lasting 12 seconds, while the CVR record contains a specific noise of rotation of the trim wheels located on both sides of the central pedestal. As a result the aircraft, having climbed to about 1000 m, turned into descent with a negative vertical acceleration of -1g. The following crew recovery actions did not allow to avoid an impact with the ground. The aircraft hit the runway about 120 m from the threshold with a speed of over 600 km/h and over 50 degrees nose down pitch. 00:41 FZ981 impacts airport terrain after a steep descent from 900 m.
Distance from Dubai Airport to Rostov Airport as the crow flies is 2787 km (1742 miles).